Intel and Micron have developed a new chip that combines memory and data storage in one. Intel and Micron say they have a new computer chip that will make your gadgets significantly faster, more durable and able to store way more data. If the claims hold up, the new chip could serve as a momentous achievement for the computing industry, ushering in a wave of new devices. The new technology, called 3D XPoint, was developed by combining a computer's memory (RAM) and data storage (hard drive or Flash drive) into a single chip. By putting those two elements so close together, Intel (INTC) and Micron (MU) say gadgets running 3D XPoint will be 1,000 times faster and durable. They'll also be able to hold up to 10 times more data than those devices using current flash memory drives -- and they'll take up the same amount of space. The new chip is so fast, that if you could drive at its read-write speeds, you could condense an hour-long commute into less than four seconds, the companies claim. And since the memory chips are 1,000 times more durable, gadgets' lifecycles will also be much longer. All of that's possible because the new chip has a cubical grid structure that doesn't use transistors. Today's memory chips use transistors in each cell to write and access information. 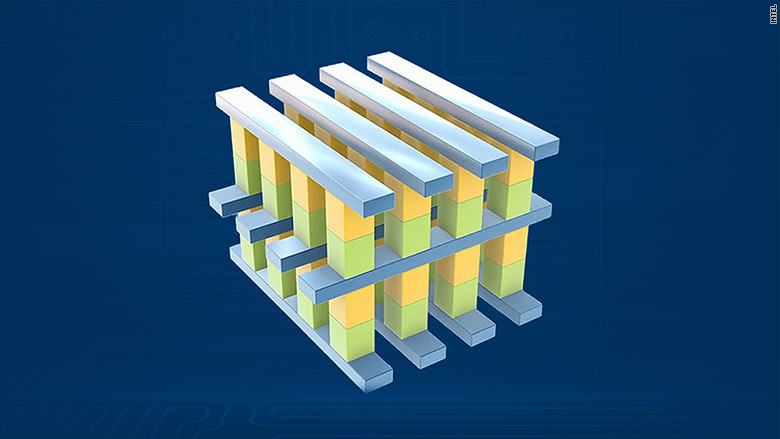 The 3D XPoint structure eliminates transistors, because it can send different voltages through each wire to communicate with each memory cell. "For decades, the industry has searched for ways to reduce the lag time between the processor and data to allow much faster analysis," Intel Senior Vice President Rob Crooke said in a statement. "[3D XPoint] achieves this goal and brings game-changing performance to memory and storage solutions."